Cucumbers & Gin, live at Exapno tomorrow night! Tomorrow night, Sean-David Cunningham is going to perform Cucumbers & Gin live! After all our work on the Kickstarter campaign, on the recording, and on the film, it’s easy to forget that you can also just go up to people and perform for them. The concert’s at the Exapno New Music Community Center, where I’m on the board. The show features Florent Ghys, the illustrious French bass player and composer whose website reminds me that I really don’t know French very well. Konrad Kaczmarek, Eleonore Oppenheim and Jascha Narveson are also on the program, with string loops, more double bass, and a toy piano. 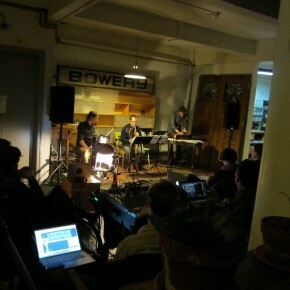 Exapno is a really interesting place, basically a co-working space for Brooklyn’s thronging composers that also hosts rehearsals and performances for its members. It’s a great resource for the field, and Lainie Fefferman is a fearless and tireless leader of the whole operation.